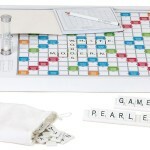 The Scrabble Pearl Edition looks heaven-sent! 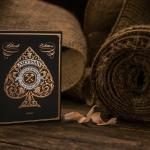 As usual, your vocabulary will be put to the test against other like minds and big words will be challenged, but the highlight of this setup has to be the clean design. 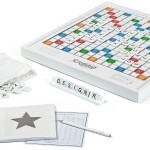 The rotating pearlescent game board features a raised grid, silver foil stamping, and white urea tiles. Use the included pencil and scorebook to tally up the points. The one with the highest score is a true wordsmith! For ages 8 and up. 2 – 4 players. Measures: 16.375 x 16.375 x 1.5 inches (approximately 41.6 x 41.6 x 3.81 cm). 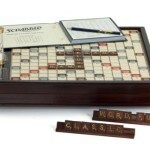 For traditionalists, there’s also the Scrabble Premium Deluxe Wood Edition made from solid wood cabinet with a mahogany finish. 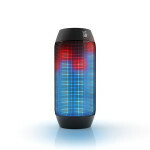 The grid is raised to eliminate the stress of sliding letters. 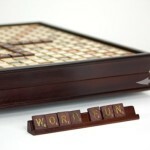 The gameboard even rotates, so there is no need to switch places between turns and mess up everyone’s words. 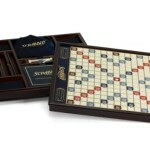 And if that weren’t enough, this wooden Scrabble also comes with gold-foil stamped solid wood letter tiles, an embroidered pouch, a gold-stamped score book with pencil, and a gold-accented timer, all of which fit in the convenient storage space beneath the gameboard. 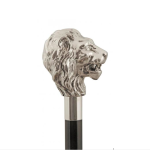 Measures: 15.75 x 15.75 x 2.5 inches (approximately 40 x 40 x 6.35 cm).